If you’re planning an event—whether a wedding, birthday, or grad party—you’ve got to feed your guests. But doing so yourself, especially for a big event, can be a daunting task. That’s why there are caterers. And fortunately, many awesome caterers call Alaska home. These caterers would be our top choices for an event! From bagel breakfast to power lunch platters or buffets for bigger groups, Sis’s Café and Catering has got you covered. They have many dishes and desserts from which you can choose to put together the perfect party. Choose one of Sis’s catering packages or customize your own a la carte. Tasha’s Caribbean Cuisine & Catering can bring some heat and island-style flair to any event in the Interior. Whether you want curried chicken at your corporate conference or oxtail at your open house, Tasha’s can accommodate you. Be sure to plan ahead, especially in the summer season when they’re busier with regular operations. If you need elegant cuisine for a high-class function, Dianne’s Wild Fork Catering may be just the caterer for you. They can put together anything from gourmet lunch or party platters to sit-down dinners with customized menu. Dianne’s can even help manage your event. Folks who find themselves in need of catering in the capital city can rely on Abby’s Kitchen Catering & Bakery to create beautiful food for their event. With more than a decade of catering experience, Abby’s will help you realize your vision for the event, no matter the size or level of formality. Sal’s New York Grill and Catering offers custom catering for just about any kind of occasion. Whether you’d like a sit-down meal for 50 or a buffet for 200, Sal’s can help you plan the menu, set up, and staff your event. For parties of 50 or more, they will even travel to the Mat-Su Valley. It doesn’t matter if your event is china on a white table cloth or a plastic sheet on a picnic table, your guests will love you if you offer barbecue. And Big J’s BBQ caters the best ‘que in the Mat-Su. No one’s going to argue with the delicious scratch-made sides and desserts, either. On the Kenai Peninsula, Kenai Catering is the go-to caterer. They can accommodate anything from office box lunches to 500-person banquets. You’re sure to find something that will please both guest and host on Kenai Catering’s eclectic menu, or have them customize dishes for you. They even have their own banquet room that can handle as many as 100 guests. As a caterer, Peppercini’s Deli & Catering can go way beyond what one might think of as standard delicatessen fare—of course, they can cater that, too. So, if you’re looking for box lunches in a conference room or beef bourguignon in a ball room, Peppercini’s can help make your event delicious. In conjunction with CH2MHILL, Charlie's Produce, and the United Way, Peppercini's Deli and Catering provided the food shown here to help this cause. Thank you everybody for your efforts! Folks in Fairbanks can find top-notch catering from Jackie of All Trades Catering & Butler Service. This caterer specializes in casual, home-style foods crafted from fresh, natural ingredients and presented elegantly to guests. As the name implies, Jackie of All Trades can cater anything from a buffet to a tea service. Whether you’re hosting a small aprés ski soirée in Girdwood or a wedding in Anchorage, Spoons Catering can accommodate you. 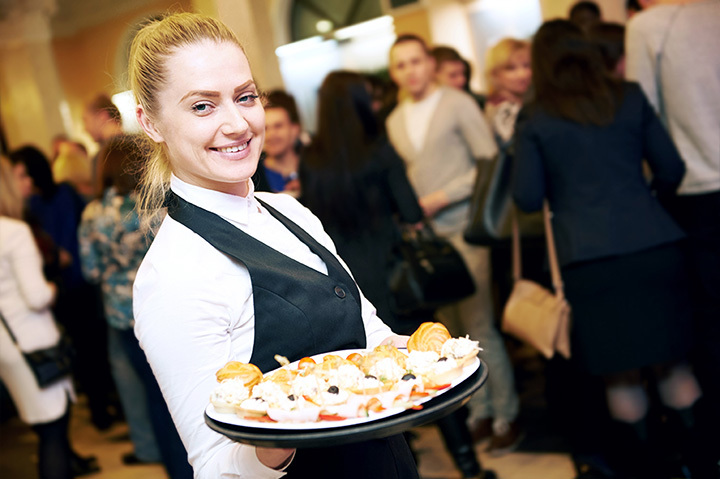 They are a smaller caterer but that contributes to their flexibility and creativity. Spoons can help you plan, create, and execute your event the way you want it.